They are now ready to cast spells, defeat trolls and dodge dragons. The outer fabric is wool suiting and the lining is broadcloth. 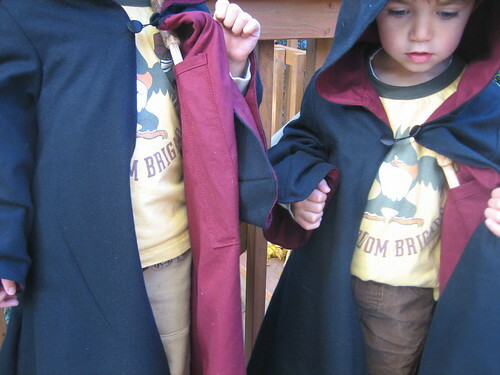 I used a kid’s Simplicity pattern for wizard robes, but changed it so much that I wouldn’t really suggest it. I used this tutorial which was easy to follow and very detailed. The wool was a little stretchy so it was hard keeping everything in line, but hey, they’re just costumes! The boys have been wearing these off and on since the beginning without arms, hoods or pockets. Now that they are finished, I can’t get the robes off. They’re already stained with jelly, markers and dirt. 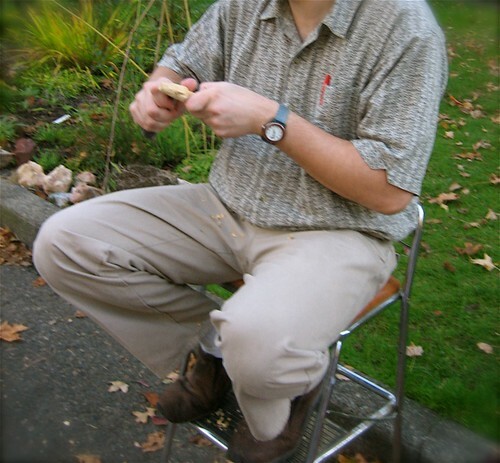 While sitting on an old stool whittling away, he realized something that I think is totally cool: his grandfather was a whittler AND he had two boys and a girl in the same order as ours! Wow, history does repeat it self, no? 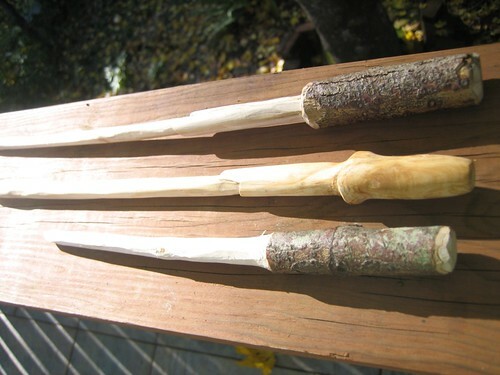 So there’s my whittler’s creations- aren’t they great?! And yes, even Ms O got one since she can’t be left out. They are carved out of Rhododendron branches, sanded smooth and rubbed with a little lemon oil. 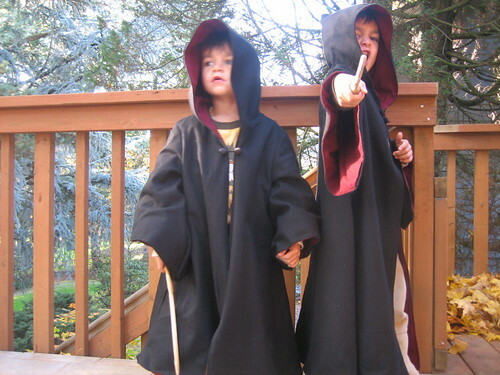 Now, if I can only get those darn robes done, my wizards will be ready for some Halloween fun! I started the boy’s costumes this weekend and I’m still not done. These are turning out to be harder than I thought since I’m doing a full lining and don’t really have a pattern. 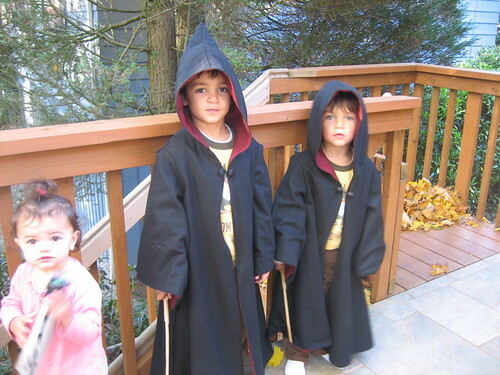 I’m trying to make nice robes since Augie and Eddie will probably wear these all year round like last year’s. 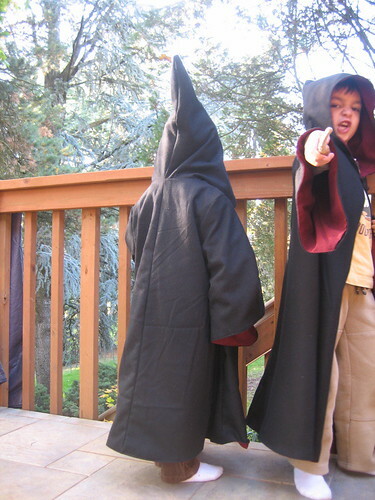 We were going to go with another Star Wars Theme, but they are in the middle of book 4 of Harry Potter so I thought wizard robes would be a nice change. Since I don’t have pictures of this year’s costumes yet, I thought I’d share what they wore last Halloween. These are a little embarrassing to show sewing-wise, but the boys love these so much I wanted to share them. 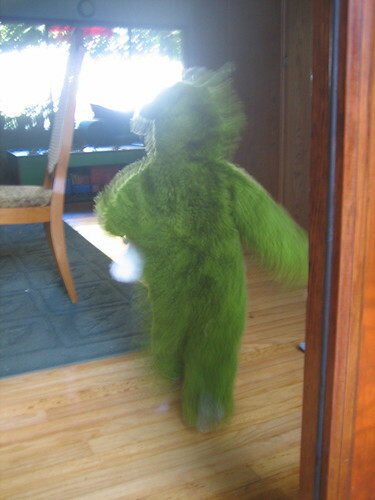 I made this sack-like outfit by simply tracing his form and sewing up the side seams. I added a hood and sewed a casing for metal hanger bent to hold the hood open. Chris attached small LED lights with a hidden battery onto a black fleece headband for his forehead and also attached some thin material to cover his face. Chris modified an old play gun into a “blaster” and found the “ammo carrier” at an army surplus store. 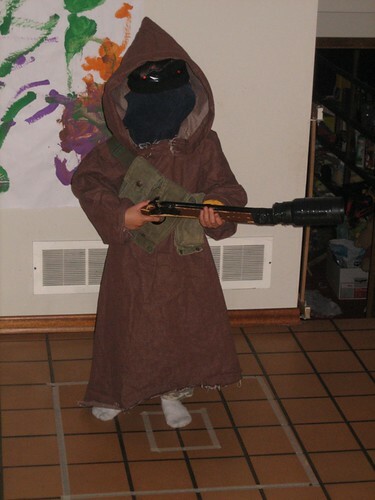 Dah- dah, our little Jawa. 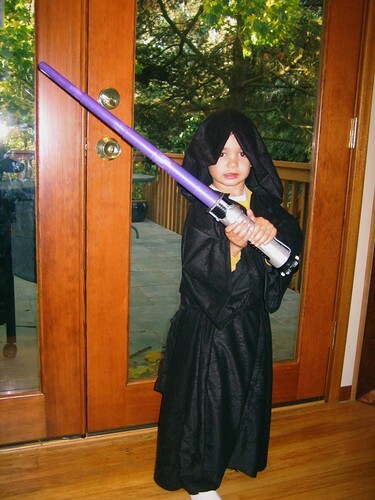 I made Augie’s similar to Eddie’s in tracing his form, but created a front opening and a belt to hold a light saber- of course! Augie’s was very simple and both outfits were done in a weekend. I’m not sure what she’ll be this year, but I’m NOT making a robe for her. 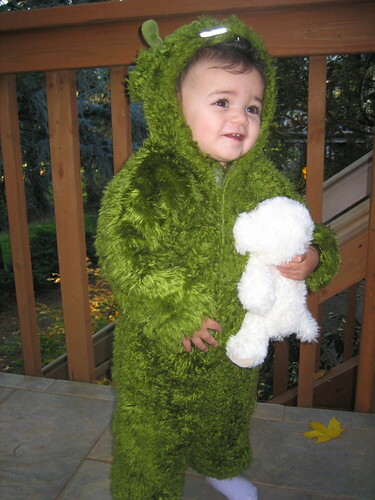 I already have a little monster costume so she may have to be one. I don’t have much time to finish the robes between watching kids and a weekend camping trip to the beach so wish me luck! I found something last night that I had sewn about a year ago and couldn’t believe I made it. The seams were ugly and very messy and the whole thing was crooked. I thought back to all the things I’ve sewn since then and realize how much I’ve learned. Back then, I used an old machine and all my sewing stuff fit into one large tote that I would drag up from the basement every so often. I now have a huge sewing cabinet stuffed with fabric, notions and projects. I have a wonderful new sewing machine that is pretty much permanently out on my dining room table along with the current project that I’m working on. 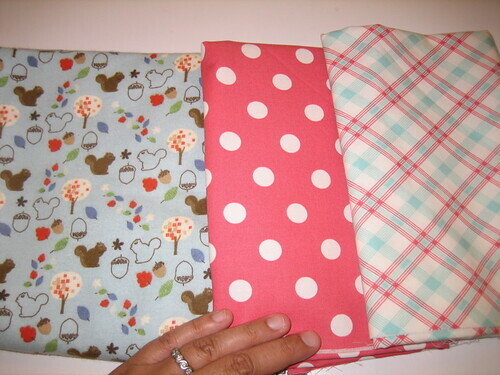 My sewing hobby really started when I discovered the whole blog world. Craft blogs are jam-packed with inspirational ideas, tutorials and wonderful stories behind it all. 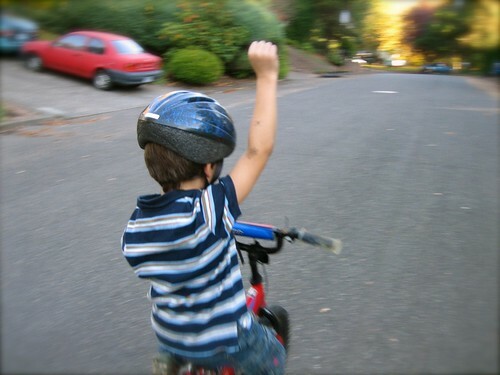 You can’t help but to get excited about trying something new and doing it yourself! Stores are filled with walls of notions and tools, but in my opinon, these are the necessary basics. A rotary cutter (this one has a 45mm blade) which is wonderful for those straight edges and quick cuts. Next is what I call my hemming ruler as I’m not sure what’s the “official” name. It’s about 6″ long and has a plastic marker that can be moved for easy, repetitive measuring. (I couldn’t find this when I was making my skirts the other day and so I made everyone stop what they were doing to help me track it down.) Next is a good pair of scissors… or two. Keep these away from everyone else and use them only for sewing! A good, sharp pair is essential. 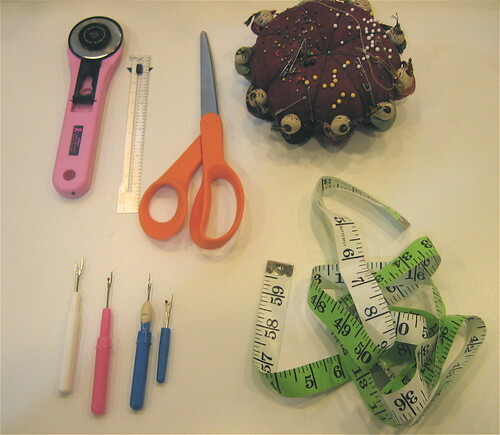 And don’t forget straight pins and safety pins with a pincushion. I was never a big pin lover, but to sew a neat seam and do it only once, you gotta use these. I love using safety pins for quilts when you have to keep all those layers together for the binding. They don’t stick out and poke you while you work like straight pins and they stay put if you have to put your quilt away. And don’t forget a seam ripper. Well not only one, I’ve found that you must own at least 4 because one is all you can ever find when you need it. If it’s not sharp, throw it away! It’ll ruin your fabric and drive you nuts if the seams aren’t cut easily. Lastly, in this photo above is a measuring tape. I suggest one with large, easy to read numbers and lines with the measurements on both sides going in opposite directions. I’ve got three of these and this is the one I use the most because of it’s size and the opposite numbers. No matter which end I grab, I can simply flip the tape to find the first inch measurement. 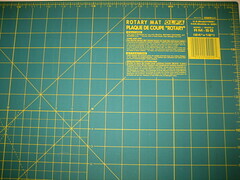 The first is a self-healing rotary mat which is necessary when using your rotary cutter. The one I have is 18 x 23, but it’s too small. I cheap-ed out and bought this one because the next size up was almost double the amount. I’ve regretted it ever since because nothing fits. I’m constantly folding up fabric in order to fit it on the mat to cut which doesn’t really give you a straight line. I think the better mat size is 24 x 36 which is on my Christmas list this year. 😉 (FYI- my mat was about $24 and the larger one is about $45.) 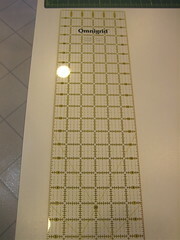 And the last tool which is by far my favorite is an Omnigrid ruler. Mine is 6 1/2 x 24 and it’s the perfect size. I use it for everything from quilts to skirts. It helps line up everything and get that straight edge to run your rotary cutter along. I also use it to take in patterns or adjust seams quickly and easily. It was 20 bucks, but I would have paid double now that I know how well it works. I’m in LOVE with these and can’t wait to get started. Hope the rest of your week goes well! 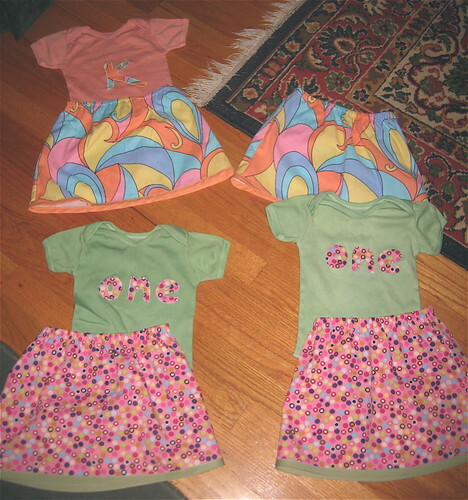 A few weeks ago, Fini asked me to make a couple sets of skirts and shirts for two little girls who will be turning one soon. 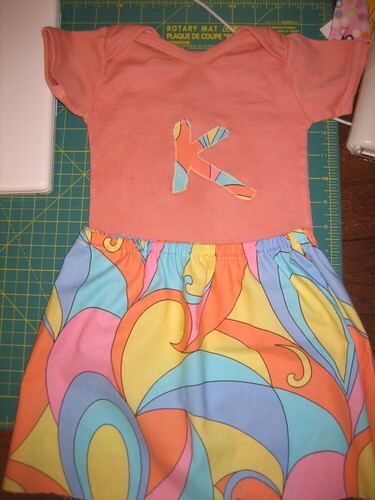 She asked me to do something similar to the skirt outfits I made for little Ms M. Fini had already bought the fabric when she was here last month so I just had to find t-shirts that would match. This turned out to be an almost impossible task since Fall Fashion is in full swing here. I searched everywhere for plain t-shirts, but couldn’t find anything that was short-sleeved and could easily be appliquéd. 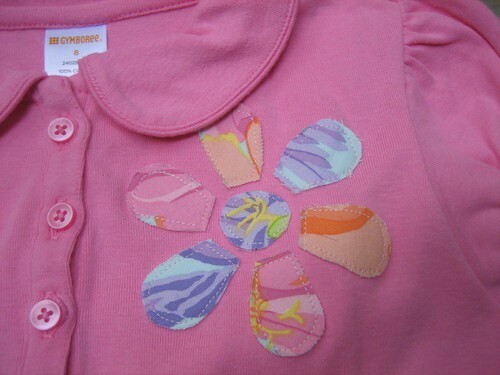 I finally found something while searching for more undershirts for Augie (who seems to be growing like a weed recently). 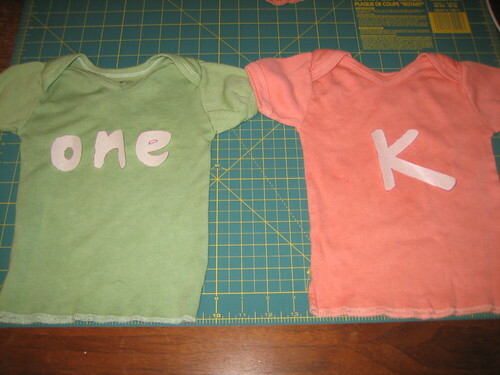 I settled on t-shirt onesies with the thought that I would simply dye them to match the fabric colors like some other great bloggers. I prepared the dye bath as directed on the Rit powder package using the stove top method. (I wanted to use the washing machine method, but I have a front loader and wasn’t sure if it would still work out or not.) I choose Kelly Green and Tangerine. I filled my biggest stock pot with about 1 gallon of water and brought it almost to a boil. Meanwhile, I dissolved the entire package of dye in 2 cups of hot water. (Make sure all the dye is dissolved and no grit is left or else you will get darker spots of color on your clothes. It takes several minutes of stirring to be sure.) After adding the dye to the pot of simmering water, I also added 1 cup of salt and 1 TB of detergent as the package directed. After mixing it all together, I saw that the dye bath looked ALOT darker than the color on the package and much darker than what I wanted. I got everything ready so I could quickly submerge and remove the shirts to keep the color as light as possible. I used a large glass pyrex bowl to put the shirt in after removing it from the bath. 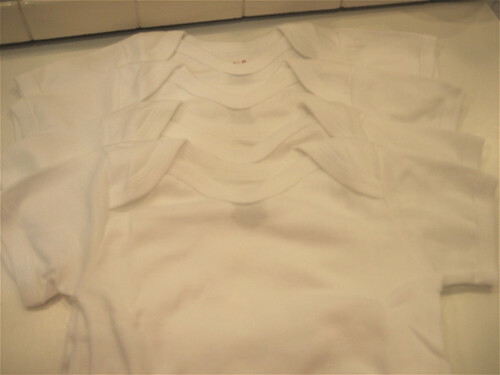 This worked pretty well and I was able to rinse the shirts in my kitchen sink without getting dye everywhere. I only had 3 little shirts to dye so I was left with alot of dye bath. I ended up dyeing some cloth diapers, our stained shirts and old kitchen rags. 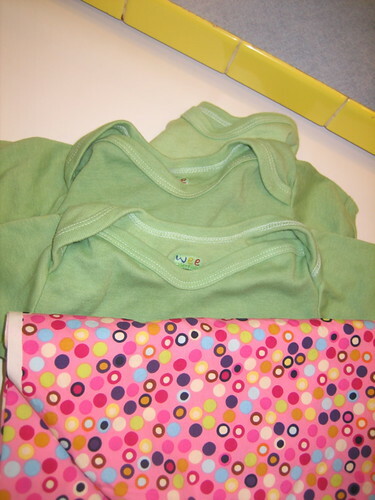 (The package says that you can dye up to 3 yards of fabric, but I was able to dye the 3 shirts, 2 L adult shirts, 6 cloth diapers and 4 kitchen rags before the color really started to change.) After rinsing everything in the sink, I washed and dried everything as usual. Overall, the dyeing process took very little time (about two hours) and everything turned out great. 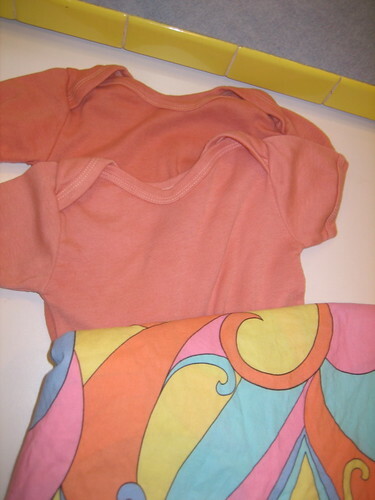 I loved the freedom of dyeing the shirts any color I wanted and really love the organic colors I ended up with. Chris likes his shirt too and has worn it twice already. (You just gotta love a man who wears stuff you do.) So if you want to try something new or give new life to something old- just dye it! I finally tried House on Hill Road’s Twirly Skirt Tutorial. It seemed like everyone was making these back in the day, but I hadn’t tried one of my own until now. 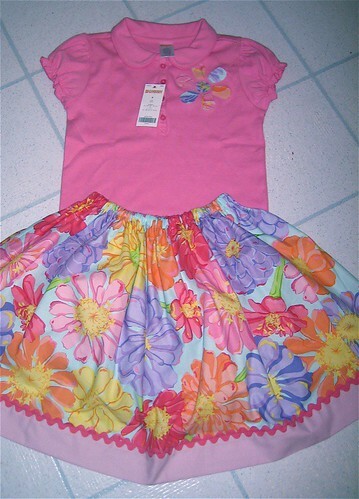 I made this skirt as a gift for an 8 year old. I did not have any of her measurements so I used some I found on the back of a pattern. Based on these, it looked like the size I would be making was 130cm off of the tutorial. Then I looked at how much fabric I would need and how much I had on hand… I did not have enough as usual. The tutorial called for two widths at 43.5″. I only had one yard so I went with what I had cutting the yard in half so I had my two widths at 36″ and my length at 22″. And thank goodness I did because the skirt turned out so bulky at the waistline! It may have been the fabric I was using since I wanted something a little thicker for the cooler weather. I advise that if you want to try it, make it out of really lightweight fabric to reduce the bulk. The skirt does twirl nicely though due to all the fabric. Other changes I made was that I did not do the waist tie, but stuck with just the elastic casing. (I’d rather adjust the fit if needed instead of having an 8 year old have to tie it herself- over on the side.) Also, I made my hem a little thicker by doubling the material at the bottom to give the edge a little more weight. I like to have a nice stiff hem that gives shape to the skirt and holds it out a bit. Other than these changes, I followed the rest of the tute closely. Easy. 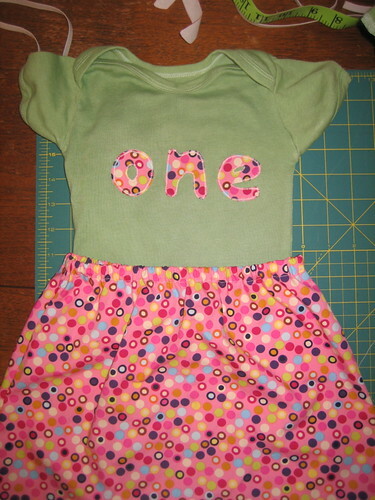 It’s a little high, but hey it’s cute now and the outfit is complete! Another gift made in an evening and happily given away. Up next, more skirts with appliquéd t-shirts, but these are hand dyed. It was fun to do and I can’t wait to share it. Come back and read more soon!